World’s Fastest Street Car destroys the quarter in 6.95 ET @ 209 mph… drives home. WTF...6.95 ET @ 209 mph in a Nova?!? Not that kind of Nova!! A quarter mile in less than 7 seconds is a mean feat for any car let alone a 3,500 pound street legal 1966 Vauxhall Chevrolet Nova. Larry Larson’s Nova is propelled by a twin-turbocharged 565 cubic-inch big-block Bowtie V8 with estimates putting it at more than 2,300 horsepower. With figures like that we are less than surprised that this automotive power house has been credited with the title of “The world’s fastest street car”. The only thing more impressive than reading this at the all new Turbo-Nutters site is seeing the amazing videos. 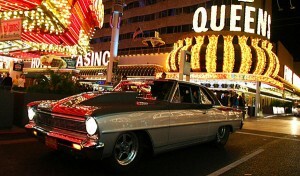 Read more to see Larry’s Nova in action. Again… speakers up! 1 Pings/Trackbacks for "World’s Fastest Street Car destroys the quarter in 6.95 ET @ 209 mph… drives home."